We’ve enjoyed a nice weekend with Grandma & Grandpa and I’ll get around to posting the pictures soon. I just wanted to share a little funny anecdote before I forgot. We went to the Grands straight from an Easter Eggstravaganza, so the kids arrived with bags full of candy they were constantly clamoring to eat. One night, after dinner, the kids requested dessert. 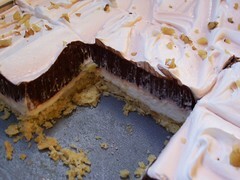 And Grandma pulled out a heavenly chocolately cool-whippy concoction that was delicious. But Sam said he didn’t want it, he wanted candy. I told him that a homemade dessert is always better than something made in a factory and that it was rude to ask for candy instead of something the cook makes. Is that a kid a stinker thinker or what? My kids are the same way. They would rather have some sugary small packaged candy over any homemade dessert. I don’t understand it.